General information: Air hockey table too. Corner location pub somewhat isolated on the wrong side of Southampton's central parks. I dropped in here after doing the Southampton Half Marathon last year. The staff and customers were moaning about how the marathon was making things awkward to move around Southampton, until they noticed my medal, then they became quite positive about the event, and were asking me friendly questions. The pub looks a little bit run down and scruffy, but it was friendly enough. oh dear! we went in here recently, approx 10pm, there were babys in the pub!! and the interior looked dire we just walked out again. Never to return. Not my normal pub in Southampton but ended up here after the game yesterday. Only one real ale, Courage Best. They were doing a Saints based quiz and handing out some free drinks, had a couple of Mickey Finns. AC/DC was playing loud and there was a really good atmosphere. Superb, really friendly pub with great music (usually rock)! 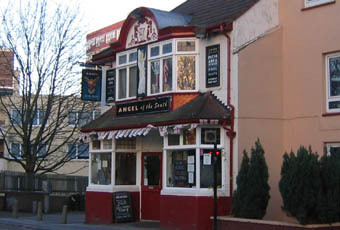 If you like trendy plastic high street pubs then The Angel is not for you but if you like proper pubs it's great. The Landlord's legendary free drinks quiz is fantastic and the cocktails are good too. I went in here on a Saturday night after a Saints game a nd got hammered for free. A quiz was going on and all you had to do was shout out the answer and if you got it right you got a free vodka or pint. Being the smart arse that Iam nearly had a drink after every question. Highly reccomended.